The other day, for one reason or another, while talking with my wonderful mother, we stumbled upon the topic of the universe. Specifically about the scale of it all; how its literal astronomical size seems too daunting to comprehend. But how does this relate to Akatsuki no Yona, an anime that has about as much relation to outer space as does a piece of paper? Well, condense the thinking: despite the vastness of it all, we exist here, right now, at this very moment. Therefore, is it too silly or arrogant to think that we have some “reason” for living? That, perhaps, our life should have some purpose to it all? It is quite the interesting thought, one that this anime explores with some elegance. Akatsuki no Yona’s main heroine is Yona, the daughter of the current King Il. 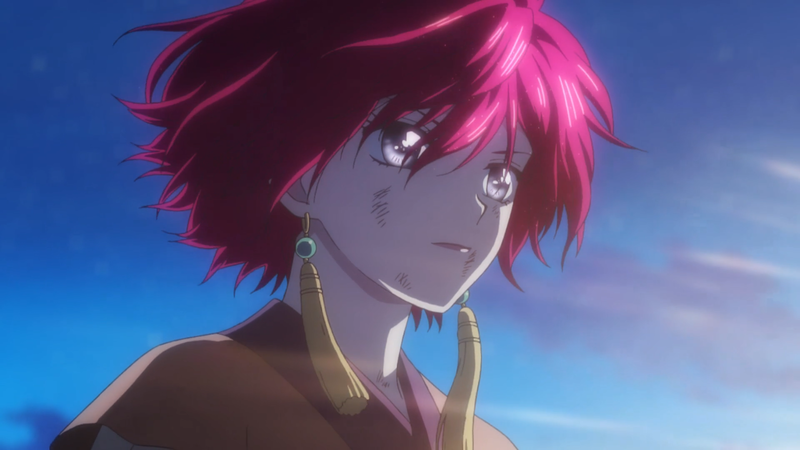 But after a savage turn of events, Yona flees the castle with her trusted body guard, Hak Son, beginning her on the road of a life-changing journey. What’s intriguing about the show is that the actual narrative and setting lends itself well to the adventurous nature that it embraces. Taking place in a China-like land, the era the cast find themselves in contains: kings, lords, clans, wars, and feuds. Therefore many of the conflicts revolve around these separate facets that predated modern society. Startling betrayal of close confidants, deceptive tactics to cause territorial harm, and unruly rulers holding an iron grip over a harbor town are just a smattering of what the show has to offer. But it’s also more than just the problems that are faced. The background also serves well for the plot’s direction, too. It’s a classic tale that fits nicely in this classical setting; essentially, Yona is tasked with “finding X amount of Y,” where X is four and Y is the Dragon descendants. This sounds more mathematical than fantastical, but this formula works in tandem with the aforementioned adventuring. In essence, the anime becomes segmented into distinct arcs, making it a quest whose end is already known. The audience knows that Yona will acquire her destined companions, so it becomes not a question of if but a question of how. Thus, the show plays out, with significant focus on each soon-to-be acquired group member — Ki-ja, Shin-ah, Jae-ha, etc. — allowing ample time for everyone involved in the main cast to hold a spot in the overall equation. 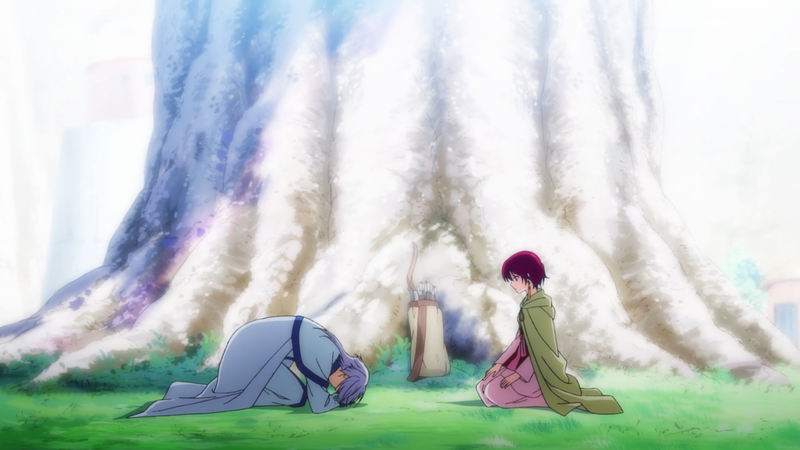 Where Akatsuki no Yona dips slightly, and somewhat ironically, is in not having enough variables fleshed out. 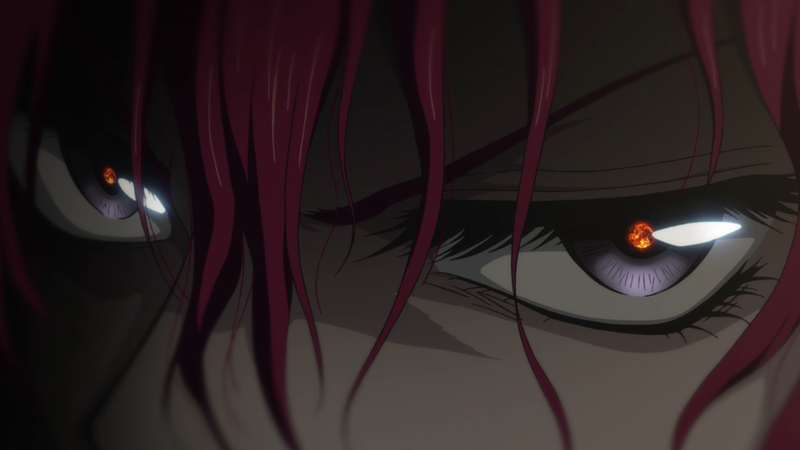 Speaking more concretely, while the focus on Yona, Hak, and the rest of the troupe is evident, exorbitant even, the focus on Soo-won, “the bad guys,” and the neutrals are not. This may not even be the anime’s fault; it obviously needs to follow the escapades of the main cast. But much of Soo-won’s motivations and the happenings of everyone else that is not Yona is left mostly up in the air. Part of the reason for this is to maintain a feeling of mystery; enshrouding Soo-won’s actions in darkness leaves his character up for contention. In other words, it’s not wholly apparent if he is good or evil. But with such little limelight given to him and the rest of the kingdom, there isn’t much background or tension to make Yona’s quest seem worthwhile. Yet, the show manages to keep itself upright by making the trek itself have meaning. What is this saying? The idea of “having a purpose” has already been presented, and is what the anime follows wonderfully. Yona’s journey is one where she finds not just the rest of the Dragons, but also herself. She comes to learn of the world that her father “kept safe:” its poverty, disease, seclusion, and human trafficking. What she learns is that the world isn’t so well off. In fact, she almost cannot believe its state. And so what she concludes that she must do, what her purpose has become, is to protect those people she never knew needed protecting. And this theme is rampant within all parts of the show: the Dragons must follow their directive, the different villages harbored these fated men, Hak has his duty, Ik-su provides the prophecies, etc. Whether such purpose is predetermined or predicated doesn’t matter. For the show’s message is that, whether you be a servant of a castle or a local pirate mother, everyone has a purpose. The art for Akatsuki no Yona is difficult to describe. On the one hand, it’s quite situational. And that’s in every sense of the word: forests, towns, castles, cliff-sides, and caves are regularly visited, making the world itself seem vast, venerable, and vibrant. On top of this, everything fits nicely with the feudal, China setting discussed earlier. On the other hand, though, the environments are not particularly gorgeous nor are they horrid to look at. In short, they serve their purpose as set pieces without enough pizzazz to make them captivating. The anime also employs a cartoon-like style during the many comedic moments it boasts, which is used to good effect. The character designs are well done for each of the cast members. Yona’s fiery-red hair and peasant outfit; Hak’s signature weapon and blue robe; and the Dragons’ respective colors, attire, and uniqueness in details are all well-crafted. One gets a real sense of their power and importance by simply looking at them. Actual animation is usually slightly above average. There are certain segments where it really picks up — Hak’s “one versus many” battle in the mountains is a great example of this — but it consistently remains at a general evenness. There is a good amount of talking and sitting that is interjected with action sequences here and there, and while they have their nice moments of animation, the majority is not overly impressive. Akatsuki no Yona contains a nice cast of characters, from the mains to the sides. At the top of the totem pole, but not so in royalty any longer, sits Yona. Kind of heart yet ignorant of the world outside the walls of her castle, she discovers that the former isn’t always found in the latter. She falls from dainty princess to defenseless plebeian, with such a predicament resting uneasily within her. Not for the fact that she is no longer pampered or waited on, but for the fact that she feels helpless, that she is incapable of doing anything remotely worthy of her and Hak’s situation. Her mindset changes with her hair; the cutting of one’s flowing locks is symbolic of change for the better, which is exactly what Yona undergoes. After learning of the legend she is slated to take part in, she goes from feeling helpless to wanting to be helpful. And this is what happens over the course of the anime; her eyes face the reality of the kingdom she’s never truly known, getting to experience its people, its cultures, and its hardships. Slowly but surely, she transitions from having to rely to standing on her own. By journey’s end, while it is clear she has yet to fully relinquish everything from her past, her sights are firmly set on becoming the aid her people have always desired. As for Hak, the other lead found from start to finish, he sits in a rather precarious position. 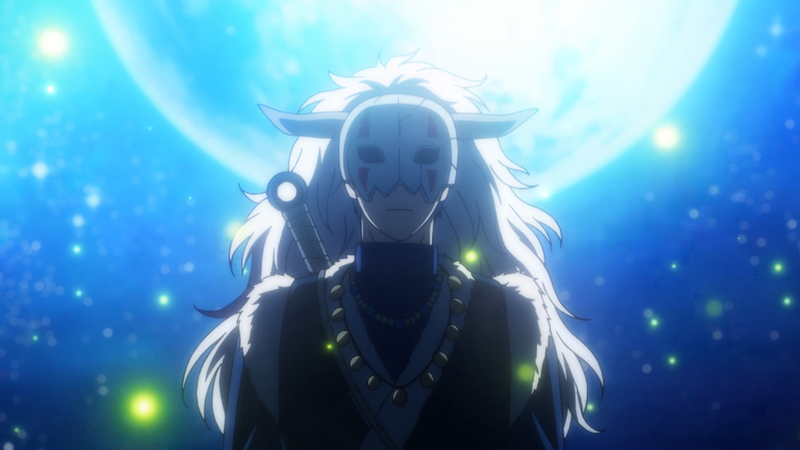 Stoic, strong, and stupendous at fighting, he’s one of a handful of people who initially sides with the young Yona. 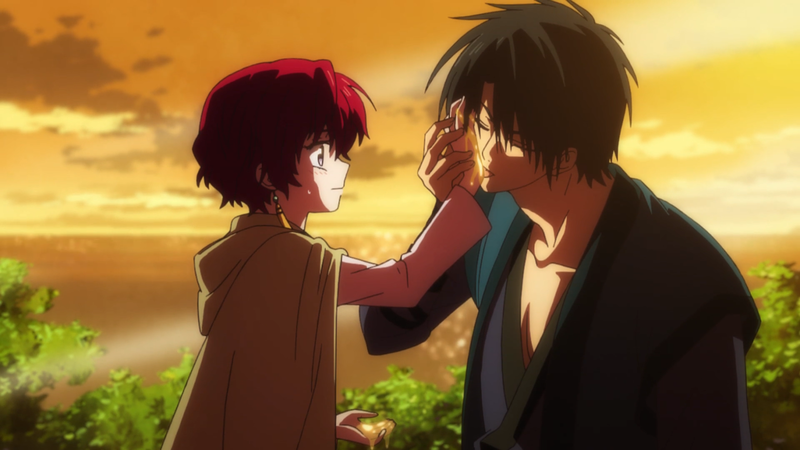 The beginning of the anime showcases his past; childhood friends with both Yona and Soo-won, but relegated as a bodyguard as opposed to ascending as the object of her affection. That is the source of his inner conflict: loving the girl who doesn’t love him back, trusting her enough to do things on her own, suppressing his desires, wondering how she’s doing, wanting to be by her side, and acting jealous of the man she cannot seem to forget. Those are way too many emotions for a single person to handle, let alone one of them. And while Hak fights his true feelings, he doesn’t always win; there are times when he can’t hold back his passion for her. Most of all, he’s scared. Scared of her becoming powerful enough to no longer “need” him. Because he wants her to need him, more so than anything else in the world. And thus the mighty “Thunder Beast’s” only weakness is revealed: it’s not having his love go unreciprocated but losing it entirely. The rest of the important members — Yun, Ki-ja, Shin-ah, and Jae-ha — all typically follow the same route. Find said character, discover what makes him unique, explore his past, and ultimately add him to the gang. This process sounds monotonous, but it’s not; each character is given ample time to be developed within his respective arc. Even after his arc ends, the character still plays a role within the narrative and group, but isn’t the sole focus anymore — that is granted to the next person in line. What’s most important about each of the characters, though, is their reason for joining. There has already been talk of purpose, but each is driven by another factor: Yona herself. This just isn’t due to the Dragon’s blood coursing through their veins. They all understand something through her that they themselves couldn’t. Jae-ha realizes the worth in struggling as opposed to staying content. Shin-ah finally feels compassion from another. Ki-ja has someone who he can closely relate to in status. Yun learns to avoid being so judgmental. 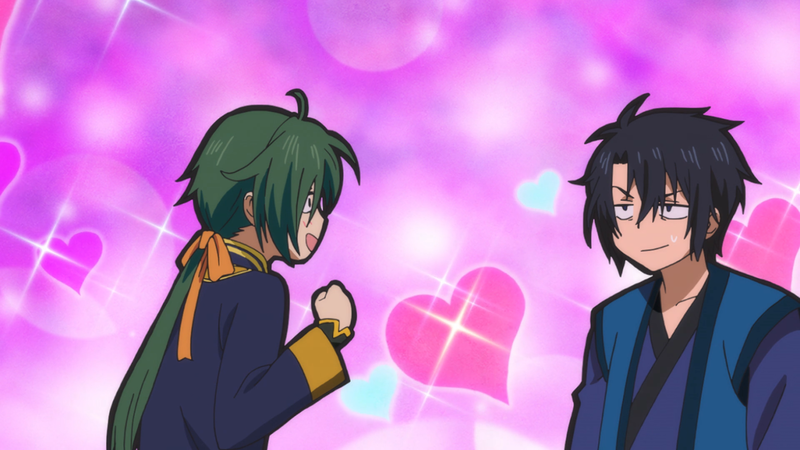 And Hak has something he loves more than words can describe. In other words, while Yona needs all of them in order to achieve the goals she has set for the future, they likewise need her to feel complete in the lives they live. Part of what makes the first OP so good is its lack of lyrics. Being able to engross one’s self in the violins, flutes, and drums, without being distracted by a vocalist, is what the piece nails. It’s orchestral, fleeting, and foreboding, all at the same time. The second OP is weird. It doesn’t fit, at all, with the show’s mood or general atmosphere. But the slapping guitar, catchy up-and-down beat, and modern-pop tone makes it, at the minimum, quite interesting to listen to. The first ED slows everything down. The male singer starts off quiet, working in harmony with the gentle guitar playing. The halfway point introduces the hard guitar, and the song continues with this combination until its end. The piece is okay, and easily the worst of the four. The second ED, however, is a fantastic track. It begins with a resounding chorus, which leads into quiet, whispering singing backed by a light guitar. Then it hits its stride, with the vocalist and background singers working in unison. The instruments follow the beautiful vocal work, with the beat maintaining a nice rhythm. Overall, it perfectly captures the vibes of the anime itself. The soundtrack contains tense, violin-filled tracks during suspenseful moments; gracefully-chimed and flute-and-guitar tracks during the more peaceful ones; and piano arrangements that appear for the scenes that are significant or moving. The soundtrack is wonderfully composed, lining itself nicely with what the anime has to offer. And as for voice-acting, it’s somewhere between average to above-average. A special shout-out goes to Chiwa Saito as Yona for her perky voice. The anime was quite hilarious throughout its run. The various character interactions and their respective antics — Shin-ah’s way of sleeping, Yona’s obliviousness to Hak’s feelings, Hak’s abrasiveness towards Jae-ha, and Ki-ja’s embarrassment during certain situations — were well polished. It made for an exciting and comedic time when the show wasn’t showcasing drama or fighting. And that drama was usually quite thrilling, too. Seeing Soo-won’s treacherous actions, watching Hak desperately try to break through a cave-in, or being taken aback by the fiery intimidation that emanated from Yona’s eyes; such scenes usually had me wondering what was in store for the cast at the next turn of events. Akatsuki no Yona concludes in a rather open-ended fashion. But with its interesting storytelling, nice characters, and orchestral music, the show leaves me anticipating the rise of that next, new dawn.